Posted on 7, February 2019 by EuropaWire PR Editors | This entry was posted in Aviation & Aerospace, News, Russia, Science, Technology, United Kingdom and tagged British science, Chris Skidmore, Colin Paynter, Dr Alice Bunn, ESA, ESA-Roscosmos ExoMars mission, European Space Agency, ExoMars rover, Johann-Dietrich ‘Jan’ Wörner, Mars, Oxia Planum, Robotic Exploration, Rosalind Elsie Franklin, Rosalind Franklin, Roscosmos, Tim Peake, UK Space Agency. Bookmark the permalink. LONDON, 7-Feb-2019 — /EuropaWire/ — UK Science Minister Chris Skidmore and British European Space Agency (ESA) Astronaut Tim Peake revealed the name of the UK made ExoMars rover on an event in the ‘Mars Yard’ at Airbus Defence and Space UK in Stevenage. ExoMars rover will be named after UK scientist and co-discoverer of the structure of DNA – Rosalind Franklin. Rosalind Elsie Franklin was a British biophysicist, physicist, chemist, biologist and X-ray crystallographer with significant contributions to the understanding of the fine molecular structures of DNA, RNA, viruses, coal and graphite. She went to Newnham College, Cambridge in 1938 and passed her finals in 1941, but was only awarded a degree titular as women were not entitled to degrees at that time. Rosalind Franklin received a PhD from Ohio University in 1945. The ExoMars rover is going to be sent on an exploration mission to the red planet in 2021. ESA’s ExoMars rover and Russia’s stationary surface science platform are scheduled for launch in July 2020 and expected to arrive at Mars in March 2021. Oxia Planum near the Martian equator has been selected by experts as the landing site for Rosalind the rover due to its geology and the likelihood of finding signs of life. The rover is part of the ExoMars programme, which is a joint endeavour between European Space Agency (ESA) and the Russian State Space Corporation, Roscosmos. The UK Space Agency has invested €287 million in the mission and £14 million on the instruments, which secured key mission contracts for the UK space sector. It is the 2nd largest European contributor to the ESA-Roscosmos ExoMars mission. 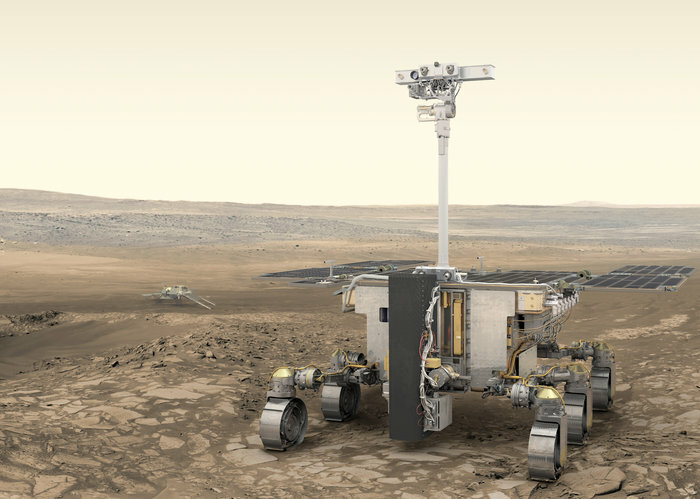 The name for the ExoMars rover ‘Rosalind Franklin’ was chosen by a panel of experts from a shortlisted name proposed by the public, following a naming competition opened in July 2018 in which nearly 36,000 people responded. The entrants that guessed the final name were invited to the naming ceremony at Airbus. More than 30% of the science instruments used in the ExoMars mission are led by women. It is a tremendously fitting tribute that the rover has been named after Rosalind Franklin as she helped us understand life on Earth and now her namesake will do the same on Mars. Just as Rosalind Franklin overcame many obstacles during her career, I hope ‘Rosalind the rover’ will successfully persevere in this exciting adventure, inspiring generations of female scientists and engineers to come. This is a big moment for British science and through our modern Industrial Strategy we are embracing this moment as part of our ambition to be the world’s most innovative economy, creating opportunities for business through science. Rosalind Franklin is one of science’s most influential women, and her part in the discovery of the structure of DNA was truly ground-breaking. It’s fitting that the robot bearing her name will search for the building blocks of life on Mars, as she did so on Earth through her work on DNA. This rover will scout the Martian surface equipped with next-generation instruments – a fully-fledged automated laboratory on Mars. With it, we are building on our European heritage in robotic exploration, and at the same time devising new technologies. This name reminds us that it is in the human genes to explore. Science is in our DNA, and in everything we do at ESA. Rosalind the rover captures this spirit and carries us all to the forefront of space exploration. Integration of the ExoMars rover, or rather Rosalind, has started here in Stevenage and the teams are now working round the clock in the sterile cleanroom to make sure she will be ready to fly next year. ExoMars is the culmination of our industry experience over the last half a century where we have worked alongside academia and agencies to push the boundaries in space both for satellites and missions to other planets.